With strong competition for university places and in the workplace, young people are becoming increasingly aware of the need to build their CVs, provide the right material and evidence for their UCAS forms and even to give them an edge within their course work. Volunteering is therefore a great way to get experience, develop new skills and gain a competitive edge. It can also be fun and allows young people to make new friends and contribute to their communities. Schools are a key partner in helping young people engage with volunteering, and Volunteer Now has developed a range of opportunities and support to help schools and colleges throughout Northern Ireland play a leadership role. 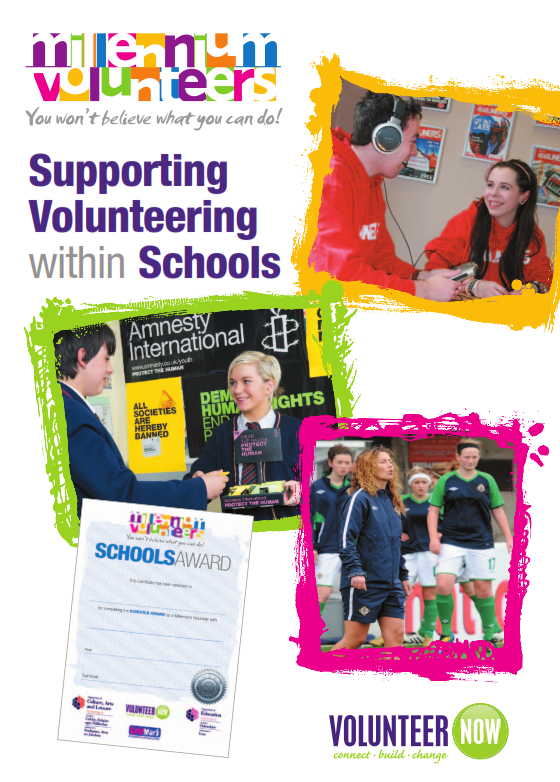 For more information download our Volunteering in Schools booklet or see below. Working with schools to deliver tailored talks and workshops to pupils on the benefits of volunteering to them and their communities. Volunteer Now can also help schools with the development of programmes such as COPE, the Duke of Edinburgh Award and volunteering/charity programmes that allow their students to take part in volunteering as part of the curriculum, this includes helping to source volunteering opportunities. We can also attend any careers fairs/days that you have organised and tell your students about the importance of volunteering in relation to employability. Contact the Youth Team if you would like to arrange a tailored session or support for your students. Volunteer Now has also developed a schools programme as part of our Millennium Volunteers (MV) scheme. This programme is backed by the Department of Education and is provided to school free of charge. MV allows schools to recognise the contribution that their students make within their school through things like peer mentoring, homework clubs, sport and societies, as well as any outside volunteering organised by the school, such as visits to care homes and conservation work. The MV Schools programme also allows for recognition of any other volunteering that young people may be involved with outside of school. Click here to find out more information about the MV for Schools programme. The Youth Team are working with SEN Schools across NI who encourage and support their students in volunteering. We have worked with those schools to overcome any potential barriers as well as offering flexibility. For example, concerning the ‘Schools Certificate’ which requires 35 hours of volunteering in order to achieve, we have agreed with individual schools a more manageable amount of hours depending on circumstances, resources and abilities. To explain further and give you some more encouragement take a look at the case study of Glenveagh Special School’s (Belfast) experience that outlines some of the issues you may face and suggests potential ways of overcoming these.